A comprehensive text on respiratory care for neonates, infants, and children, Neonatal and Pediatric Respiratory Care, 4th Edition provides a solid foundation in the assessment and treatment of respiratory care disorders. 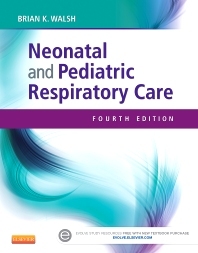 Clear, full-color coverage emphasizes clinical application of the principles of neonatal/pediatric respiratory care. New to this edition is coverage of the latest advances in clinical practice, a chapter devoted to quality and safety, and summary boxes discussing real-world clinical scenarios. From author Brian Walsh, an experienced educator and respiratory therapist, this text is an excellent study tool for the NBRC’s Neonatal/Pediatric Specialty exam! A comprehensive, evidence-based approach covers all of the major topics of respiratory care for neonates, infants, and children, including both theory and application. Case studies help you master the more difficult areas of care for neonatal and pediatric disorders. Logical, streamlined organization makes it easier for students to master the material and prepare for an entry-level BS degree and the national Neonatal/Pediatric Specialty credentialing exam. Learning objectives at the beginning of each chapter highlight the "take-aways" by breaking down key content into measurable behaviors, criteria, and conditions. Complete test preparation is provided through coverage of all the content in the matrix for the NPS exam. NBRC exam-style assessment questions test your comprehension of the material in each chapter. Answers to assessment and case study questions are provided on the Evolve companion website. 36. Quality and Safety NEW!